Truly the finest beachfront villa in all of Huatulco! 4 beautiful bedroom suites, beach view living and dining areas, infinity pool, rooftop terrace and more await you at Villa Escondida. Guests at the villa are catered to from the minute they walk through the ocean view entry. Enjoy the privacy & comfort of a home combined with the amenities of a five star hotel. The first suite (master suite) is roughly 600 sq ft and contains a king size bed, an oceanfront terrace with 2 swivel rockers, walk-in ocean view shower, double ocean views and walk-in closet. The second suite (junior suite) is roughly 400 sq ft and features a king size bed, sun terrace with bistro set, ocean view bedroom & bathroom and his & hers armoires. The third suite (junior suite) is roughly 500 sq ft and contains a king size bed, separate sitting room with TV, pull-out double sofa bed, large sun/garden terrace with bistro set and a large armoire. The fourth and final suite (standard suite) is roughly 300 sq ft and has the option of either a king size bed or 2 twin beds plus a walk-in shower with natural rock view, ocean view bedroom and two armoires. All suites feature mini refrigerators, cantera tile, air conditioning and ceiling fans, double bathroom sinks, unique handcrafted furnishings and finishes, high speed wireless internet, multi-lingual satellite television and fresh flower arrangements. This stunning villa offers all of the amenities you would expect from a five star hotel including concierge service, infinity pool, nightly turn down service, air conditioned bedrooms, mini refrigerators, high speed internet and multi-lingual satellite television. Features include: indoor & outdoor living rooms, formal dining room, fully appointed kitchen with top of the line appliances, infinity pool, rooftop terrace, outdoor lounge decks and amazing ocean views. This property comes with private chef service included; Chef Delfino will be onsite to prepare breakfast, lunch and dinner. You can be as involved in the menu selection as you'd like! The team will do the grocery shopping and present the bills throughout the stay. Step out the door of this spectacular villa and find yourself on the sandy beach of Bocana where you can stroll the beach, surf, swim or just relax and take in the sun from one of the villa beach lounge chairs. Playa La Bocana is a rustic paradise graced with the most beautiful long ocean beach in Huatulco. Kissed by the Pacific Ocean, it is a surfer's paradise. Bisected by the Rio Copalita, it is a naturalists dream filled with land and sea birds, roosting in the fresh and salt-water estuary. Pueblito Playa Bocana is nested between Bahia de Conejos and the Copalita Archeological Site. It is just a short walk from the planned hotel zone in Bahia de Conejos and the most important archeological discovery on the Pacific Coast of Mexico in this century. Amazing property with even better service. This is a really great property with even better service right on the beach. The staff was great. Delfino, the chef, was the best! All of the meals he made for us were better then anything we had in town. The maintenance of the property was perfect. Our experience at this property was a 10. We will definitely be back. Thanks so much to the staff. Dear Steve, thank you for sharing your experience at Villa Escondida. I am very happy to know that you spent an amazing time at the Villa enjoying Delfino meals and the proximity of the beach. We will look forward to your return. Regards, Cathy Bergamo & Your Friends at My Huatulco Vacation. Location and Staff what more can I say! This was the second stay for our group at Villa Escondida. Once again it was outstanding. The location of this villa is second to none. We again took advantage of Delphino for our meals. He was fantastic. I would strongly recommend doing this! The staff at Villa Escondida is also fantastic. Delphino, Rosa, Avi and Paulina were all so helpful. It was very difficult to leave such a wonderful place and people. My experience with the staff at My Huatulco Vacations was also great. Cathy was the best! Ross, Thank you for taking the time to share your 5 star review of Villa Escondida! It was awesome to have you back as returning guests and we’re happy to hear that your time at the property was so special and that it was such a good fit for your group. We’re also very pleased to hear that our service worked well for you and that the process enhanced your vacation experience! We will pass your wonderful comments along to our team. We hope to have the opportunity to host you and your group again one day soon! Sincerely, Your Friends at My Huatulco Vacation. Vacations that we have dealt with have been super! Our favorite activities include: a cocktail poolside (made by Delfino of course), a fire on the beach and simply watching the surfers on a daily basis. This is the most relaxing vacation we have ever been on and we are already booked to come back next year for two weeks. Amazing - even better than I'd imagined! Our trip was fabulous. The house was every bit as lovely as the photos show - and more. We loved everything - the kind people who worked at the house (Delfino, Rosa, Lucero, Paulina and Abi), the delicious food and drinks, the warm sunshine, the massages, and even just wandering around in town. I would absolutely recommend this - and can't wait to go back again! Dear Heidi, Thank you for taking the time to share your experience at Villa Escondida. I am glad to know that the Villa reached your expectation, and as usual Delfino and his staff made the difference with their amazing service and attention to details. We hope having the opportunity to host you again in the future. Regards, Cathy Bergamo & Your Friends at My Huatulco Vacation. We had the privilege of enjoying this special villa from Nov. 17-27, 2018. Delfino. Rosa, Paulina and Abi quickly learned what we needed and adjusted their service and offerings to suit each of us. Even though Delfino is the only one of the team that speaks English we felt a real connection and sense of caring from all of them. The meals were amazing. The sunrise and views unforgettable. The villa is clean and well equipped for rest and relaxation. We enjoyed in -villa massages, star gazing on the roof top patio , boogie boarding on our beach and lots of soaking up the sun, surf and ocean gazing. We will never forget our time together and will do all we can to return again. Dear Christine, thank you so much for sharing your amazing time at Villa Escondida. I am so happy to know how much you all enjoyed the Villa accomodation, the great staff and your time together in Huatulco as family. We hope to have the opportunity to host you again in the future. Take care, Regards, Cathy Bergamo & Your Friends at My Huatulco Vacation. After many years traveling and staying throughout Mexico, this is without a doubt one of the best experiences we've had to date. The location of Villa Escondida is simply remarkable. 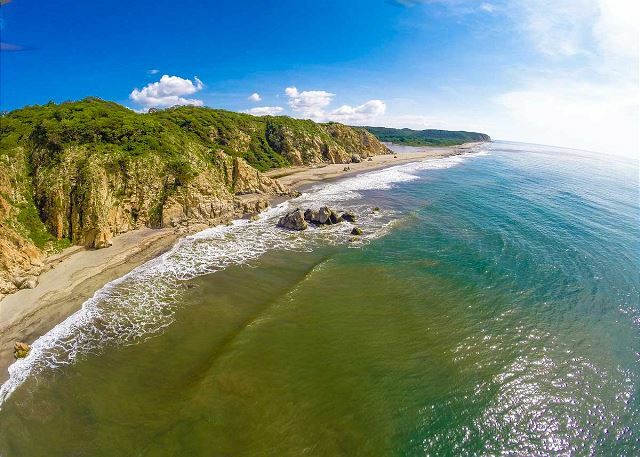 It sits on a beautiful beach, next to an Ecological Preserve and a short ride into Huatulco. The ambience of the home created a tropical relaxation from the moment we arrived. Each the four bedrooms and full bath offer very comfortable accommodations for sleeping and a bit of private time. The rest of the home creates a relaxing tone inside and outside. One of the primary reasons for our 5 Star review is due to the staff who ensured everything you need, want, and their attention to detail made us feel right at home. Starting with Delfino, and Rosa and Paulina there was not one thing you would not experience from staff in the best of hotels. The staff made us welcome from the moment we arrived until the moment we left. The team also provided in home meals: breakfasts, afternoon snacks, and dinners. We simply had to request a meal and pay for any groceries purchased. Then sit down and enjoy the amazing entrees served. I would also add that Cathy, our contact person from the beginning of exploration of this rental until after we left, was amazing. Very knowledgeable and professional. Any question that surfaced (restaurants, travel into the rain forests, car rental vs taxis, etc.) she had the answer. And it was always a prompt reply. Thanks Cathy. In sum, if you are looking for a getaway to simply relax and enjoy a beautiful spot along the southern coast of Mexico, look no further. The small town of Huatulco is minutes away along with several other beach communities each offering a welcoming attitude for visitors. Simply put, we had and amazing week long experience. Dear Mark, Thank you so much for taking the time to share your experience at Villa Escondida. As you travelled so many times in Mexico in the past years, I am truly happy to know that the staff at the Villa could offer you an amazing experience, thanks to their attention to details. I am glad to know that my knowledge about the area made the difference according you, is always very important for me to be sure that our guests have all the information they need to spend a wonderful stay at Huatulc. Little tips make the diffrence for sure in a trip! I will be very happy to have the opportunity to host you again in the future. Take care. Regards, Cathy Bergamo & Your Friends at My Huatulco Vacation. Dear Marc, thank you for taking the time to share your experience at Villa Escondida, i am glad to know that you enjoyed very much the property and you made the most of it. I will be happy to have the opportunity to host you again in the future. Regards, Cathy Bergamo & Your Friends at My Huatulco Vacation. We had the most amazing time at Villa Escondida, we had 6 adults and 4 children under the age of 4. Delfino and staff were awesome! Delfino is a culinary whiz in the kitchen, every meal was delicious!! We would highly recommend Delfino and this property. We certainly look forward to returning!! We were blessed to have the opportunity to experience Villa Escondida along with some of our friends. In all, we had three couples (6 adults) that enjoyed total privacy and a week of incredible memories. The team on-site are amazing! Their incredible leader is Delfinio and he THOROUGHLY enjoys his job, LOVES his team and his home at Villa Escondida. He speaks both Spanish and English. It is clear that all of the team (Rosa, Paulina, Abbi and Delfino) are very happy there and will go above & beyond without hesitation. We had the chef service included which was well worth the price. They also did the pantry stocking for us which saved some of our valuable vacation time. Delfino and Paulina built a bon fire for us on the beach one night that was incredible! The beach is so private/quiet during the day or night and we never felt unsafe. We are already planning to return next year for 2 weeks! If I could give it more that 5 stars I would! We (4 couples) just returned from our 14 day stay at Villa Escondida and it was better than advertised. The weather was great, as long as you like sun and heat, the villa is exceptionally well designed and the staff were the best we have ever dealt with. Delfino was a remarkable chef and could not have been more accommodating. We have rented other villa's and condos in Mexico and this was head and shoulders above them all. The beach was fabulous and never too busy, you could walk all the way to the Copalita River as well as wade in quite a ways before it got deep, so it was safe for kids or non swimmers. The villa was located about 25 mins from the airport and 10 mins to the main town square where there are shops and restaurants galore. With the great design of the house it never felt cramped even with 8 people and the staff. I would highly recommend this property along with taking the chef service, we did eat in town a couple of times and it wasn't the same. Cant wait to return. This stay was all that I expected and much more. Wonderful villa! Great staff! Hire Delfino to cook, he's a gem. Right on the beach (front biggest master bedroom hears the waves 24/7, something to keep in mind if noise is an issue), pool, hot tub wasn't working, internet didn't work most of the time. We rented a car which was great to have, taxi cabs available if you don't have a car. The Stars were fabulous at night, go up to the roof deck, lie on the sofa and look up! Stunning! Walked to Tangolunda every morning looking for birds on the way, magical, saw about 40 species every morning 7-9am. Went to various beaches snorkeling, visited Copalita Ruins (3 minute drive), took birding trips with Cornelio Ramos he is amazing!! Villa was everything we were looking for in a rental. Just returned from a wonderful visit to La Bocana and Villa Escondida. I cannot say enough about the staff at Villa Escondida. Friendly, attentive, and responsible. Delfino, Claudia, Dona Rosa...had coffee and breakfast ready every morning, called taxis, cleaned our rooms and dishes, cooked upon request...we could ask for no better care. The Villa itself is beautiful and secluded, but the staff is what made our trip.